The world is in love. At dusk, soft voices blend in marshland harmony and their chorus is lifted from the soggy earth up over the hills growing in number and strength. Each male voice calls out in desperation, dreaming of the perfect mate with whom to spend the warm days and cool nights. She is all he thinks of, all he lives for, and the reason for his song. …the mid-March crescendo of nighttime whistles from amorous males is for many a sign that winter is over. The spring peepers have awoken. Two friends, one from college & one from high school, are marrying their high school sweethearts in May. As a loyal friend and bridesmaid, I will jump into the car on Friday, drive to New Jersey to pick up another bridesmaid and road trip to Pennsylvania to celebrate with this bride-to-be. This will be my second bridal shower in just a month and I couldn’t be happier for these friends and their fiances about to embark on yet another chapter of their happily ever after. The world is in love. 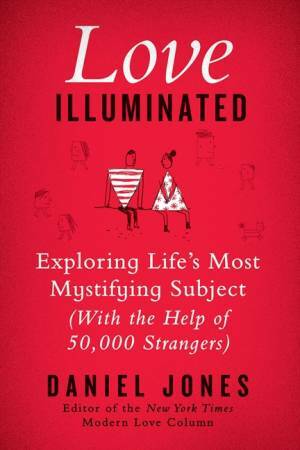 Daniel Jones is the editor of a New York Times column and author of a new book, Love Illuminated: Exploring Life’s Most Mystifying Subject (with the Help of 50,000 Strangers). Jones has received tens of thousands of stories on the topic of love and has attempted to distill them in a lighthearted and realistic manner, delving into the modern age of dating, online relationships, divorces and second chances. “After all, love is for the sucker in us, not the skeptic. Love appeals to our gullible side, the part of us that wants to believe. pg 103” And as each of these engaged couples, longtime partners and blossoming lovers take another shaky step into a unknown future, my heart goes out to them. These are brave souls. There is a great risk in putting trust in another person, giving up control and falling (or leaning) in love. In the modern age of dating, I am personally aware of the mixed signals and awkward silences. Do I like you? Do you like me? Am I too needy or overly aloof? It isn’t easy and the soul mates of the previous century seem to be a thing of the past. But people continue to find love every day and I am grateful to those people willing to take a risk–pushing their chips into the center and going all in. I know what many of you are thinking. Who is this blogger and what has she done to the jaded, hopelessly unromantic Katelyn Tsukada? Do not fret. I have not jumped over into a world of star-crossed blissful lovers or ate one too many stale candy hearts left over from February 14th. There will be no “Save the Date” at your door or elopement announcement from my parents in your Inbox (or Span folder). This love is bigger than me. It’s the sun in the morning when I wake up and the 70 degree temperatures during the day. It’s my newfound attempt to regain a healthy food diet and regular gym schedule. And maybe it’s my birthday in ten days and the nervous excitement in anticipation of a new age and new year. And maybe…maybe spring brings out that part in each of us that so desperately wants to believe in something bigger than ourselves.